Go beyond teaching content. Nurture curiosity. Open and go, real-world Math & STEAM lessons and projects your students will love. Mindsets is a Math & STEAM platform for the classroom that personalizes learning through real-world, authentic problem solving & inquiry. Live & interactive. Real time student responses make teaching, class facilitation and differentiation easier. Click on any of the Challenges to find out more! Lessons that excite. Learning that matters. Collaborate, predict, analyze data, create ideas & pitch concepts. Through Mindsets Challenges, students practice essential math & science skills in a real world-context, demonstrating entrepreneurial spirit & prepare for future success. 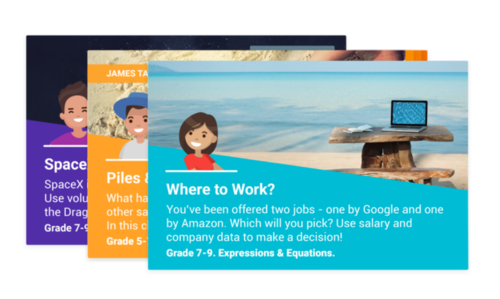 Bring real-world context into your classroom. Amp up your lessons & nurture Mindsets.